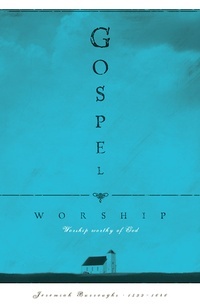 Worship is for God, not for us. Sadly, that simple statement is foreign to our day. Yet God is as clear today as He was to Nadab and Abihu in the Old Testament: He will be treated as holy by those who come into His presence (Lev. 10:1-3). Their deaths show that one cannot get too much instruction as to the right way and the wrong way to worship Him. In this treasured work, beloved Puritan pastor Jeremiah Burroughs masterfully gives guidelines to facilitate the reader to move closer to God in worship. Through 14 sermons, Burroughs carefully explains the right manner of worshipping God in the three great ordinances of hearing the Word, receiving the Lord’s Supper, and prayer. Burroughs shows that true worship is reverent, focused upon our holy God. Simply fabulous! A must read ! Simply fabulous! A must read! Squarely and poignantly characterize's who the God is that we worship and perfectly frames in what manner we should duly worship Him. You'll never be the same after reading this book. Surprisingly easy to read, and extremely relevant to our time. I will never look at worship in a casual manner again. This book is a wonderful gift from Burroughs to Christianity. But be warned, after reading this book you won't just be able to 'show up' on Sunday morning or say a 'little' prayer.